The Hanged Man corresponds to the Hebrew letter Mem, signifying waters and knowledge from the Tanakh and Torah. It represents the ocean of knowledge about God and the world. This ocean contains not only secret knowledge, but also knowledge available for everyone to see. This letter also represents the idea of knowledge coming to someone, as opposed to him (or her) actively seeking it out. The letter Mem represents the wisdom that comes through experience, patience, and waiting. It symbolizes the dependence of all life upon water, and so also the dependence of every living being on the love of fellow beings and of God. As water is present in our very body, this letter also represents the entirety of one’s being, and the meditation and contemplation that can bring one wisdom. The original pictograph of this card means water, and depicts ocean waves. The letter Mem also has a second connotation: the coming of the messiah. This theme is evident in both the Thoth and Rider-Waite illustrations of the Hanged Man, which show a man hanging upside down in a way that brings to mind a crucifixion. This is also seen in one of the meanings of the card: the idea of waiting patiently for knowledge to come to you (or salvation), and the idea of sacrifice becoming salvation. The Hanged Man is associated with the element of water (Mem even means waters), which represent passivity, emotion, and intimacy. The aspect of water reflected most strongly by the Hanged Man is that of passivity; this is the most passive card in the deck. The hanged man is not a martyr, contrary to what many believe; far from it. He seeks his own salvation, and to discern how to best do this, he has stopped doing everything and is waiting for the answer to come to him. He is not hanging or being crucified; he is merely paused, waiting. This card does not represent matryrdom in any significant way; that meaning belongs to Oppression and Ruin. However, sacrifice is a theme in this card, but to make things more complicated, a paradox is thrown in; the Hanged Man represents sacrifice that allows you to be saved. He is the dying god, who rules the realm of paradoxes. He represents stillness and the wisdom that comes from patience. He also represents accepting one’s fate and the inevitable, and letting them wash over oneself. He represents the idea of losing to win, and of suspension. He represents taking a break from the stresses of life in order to turnabout and set off in a new – or the same – direction. 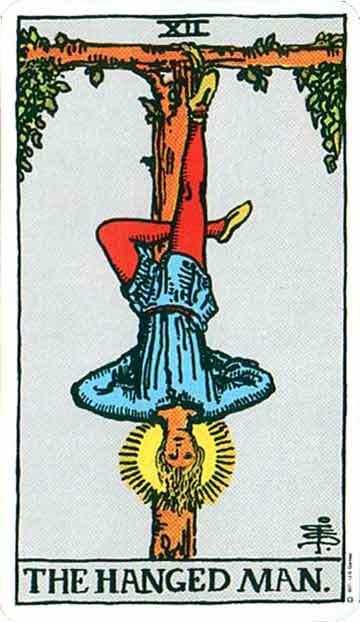 Both cards show a man hanging upside down, with one leg bent at an angle, suspended from something. In the Rider-Waite art, he is suspended from a tree, and has a halo about his head, hinting of the divine knowledge he gains through his patience. The Thoth art shows the man suspended from an Ankh, symbolizing eternal life, and his hands are nailed down, hinting at the idea of a messiah. He also has snakes about his heads and feet, representing danger and temptation ignored. If you turn the two cards upside-down, instead of a hanging man we see a dancing man – he has sacrificed what he had in order to gain a new perspective – something else that this card represents: new perspectives gained from slowing down everything in your life, stepping back, and taking a deep breath. On the Tree of Life, the Hanged Man is the path between the Sefirot of Geburah (Instability) and Hod (Knowledge). This represents the knowledge that comes out of instability; the Hanged Man steps back from the instability and chaos of his life, giving up all that he has, in order to attain wisdom and knowledge. In a reading, this card asks you to examine the role of stillness and passivity in your life. It advises you to step back and take a break, letting life wash over you. Accept your fate; some things are inevitable. What new perspectives will you gain from doing so? It also asks you to see if there is a messianic-like figure in your life, who has given up everything in order to become someone far greater. Reversed, this card’s energies can be twisted and blocked, but not necessarily. This card (for me in my own readings, at least) can be read the same both reversed and upright, for he represents multiple perspectives. However, reversed, this card can be read as an inability to rest and contemplate one’s life, or as an anti-messiah figure in your life. It could also be seen as an inability to accept one’s fate passively. This entry was posted on June 22, 2011 by Z. M. Wilmot. It was filed under Tarot .